Orlando, FL (December 13, 2016): David Weekley Homes, the nation’s largest privately-held builder, hosted its second annual, companywide Thanksgiving Drive, collecting an aggregate of 147,000 pounds of turkey and nonperishable items in 20 participating markets. The company’s efforts provided more than 149,000 meals to local families. Locally, more than 480 pounds of turkey, nearly 1,000 pounds of nonperishable items and $3,800 in monetary donations were collected during the two-week drive, which ran from November 2 to 16. Orlando team members delivered the items to the organization to distribute to families in time for the holiday, equating to more than 16,500 meals. 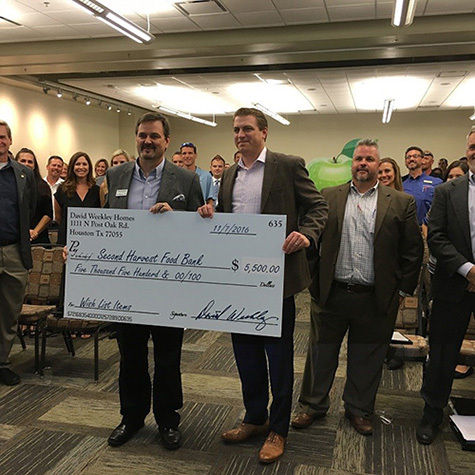 In Orlando, the Thanksgiving Drive benefitted Second Harvest Food Bank of Central Florida, an organization that distributes tens of millions of meals per year to the clients of more than 550 local nonprofit feeding programs. The Thanksgiving Drive is one of the initiatives of the company’s CARE program that joins team members with homeowners, homebuyers, community partners and local nonprofit organizations to live out its purpose of building dreams, enhancing lives in all of the communities in which it builds. Team members from David Weekley Homes donated nearly 1,500 pounds of turkey and nonperishable food items, as well as monetary donations, to Second Harvest Food Bank of Central Florida to benefit families in need. Second Harvest Food Bank of Central Florida is a private, nonprofit organization that collects, stores and distributes donated food to more than 550 feeding partners in six Central Florida counties. Our mission is to create hope and nourish lives through a powerful hunger relief network, while multiplying the generosity of a caring community. David Weekley Homes, the nation’s largest privately-held home builder, is celebrating its 40th anniversary in 2016. Headquartered in Houston, the company operates in 23 cities and 13 states across the United States. David Weekley Homes was the first builder in the United States to be awarded the Triple Crown of American Home Building, an honor which includes “America’s Best Builder,” “National Housing Quality Award” and “National Builder of the Year.” David Weekley Homes has also appeared 10 times on FORTUNE magazine’s “100 Best Companies to Work For®” list. Since 1976, the company has closed more than 80,000 homes. For more information, visit www.davidweekleyhomes.com.